The story is told of Alexander the Great, that one day, upon heading home from a victorious battle, his caravan came upon a beggar by the roadside who asked for a copper coin. Initially, the courtier sent him away, but King Alexander intervened and asked what the poor man wanted. The courtier said a copper coin. After looking at the man, he returned to his carriage to grab a bag of coins. He returned to the beggar and gave him a bag…of gold coins. The courtier was surprised by this gift, and commented, “Sir, a copper coin would have adequately met the beggar’s need and desire. 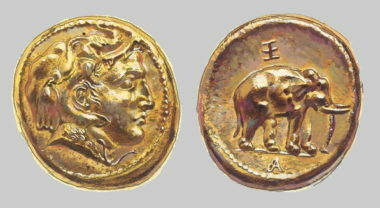 Why give him gold?” Alexander responded as a king responds, “A copper coin would suit the beggar’s need, but gold coins suit Alexander’s giving”. So often we go to God in our prayer asking for one thing, and God desires to give us so much more. In order for us to receive this “more” that God wants to give us, sometimes he responds with “no”, or “not yet”. When God answers our prayer with “no”, or “not yet”, we have to be willing to accept this answer; mindful that behind every no is an immeasurable greater yes. We often say hindsight is 20/20: “If only I knew, I would not have acted in that way”. Well, accepting God’s “no” as an answer to our prayer is faith’s 20/20. God’s “no” helps us to avoid “acting in that way”. God is a Father who is always looking out for His “best interest”, which in prayer, we quickly discover is our “best interest’. If parents are always on the lookout in what’s best for their child long term, which means saying “no”, and “not yet” from time to time, then how much more should we enter into the wonder of the Father’s “no” when it is an exercise of the greatness of His love. Just as we need to be in relationship with our parents to understand the reasons behind their “no”, all the more do we need to be in relationship with our Father to better understand the reasons behind His “no”. We do this through the reading of Scripture, the wisdom of the saints, and increasing our conversation with God in prayer. The Son of God left this world with a crown, but a crown that very few understood. It was the crown given to a King who shows us how to fight the good fight, keep the faith, persevere in the race marked out for us, and finish the course (cf. 2 Tim 4:7; Heb 12:1). Our crucified King has revealed to us that doing the Father’s will is not the road most traveled, but “less traveled”, and if we are going to share in this great mystery of doing the Father’s will, then we must seek out the deeper wisdom that lies behind the “no”. This deeper wisdom is the confidant assurance that by accepting God’s “no”, we are saying yes to the riches of God that far exceed the value of any gold coin, because they do not belong to any Kingdom of this world, but the everlasting Kingdom. These riches consist in the actual sharing of God’s very life and the treasures His grace provides. Art: Apart from the Alexander portrait discovered at his father’s burial chamber in Vergina, only one other Alexander portrait exists that was known to have been made during his lifetime. It appears on a gold coin, no larger than a U.S. penny, found in 1993 at the village of Mir Zakah in Paktia province, eastern Afghanistan. The looting of Mir Zakah in 1992-93 – which yielded some four tons of coins and some 770 pounds of gold and silver objects – is legendary. The Alexander coin seen here quickly made its way to London, where it is now in a private collection! [the owner allows the coin to be reproduced only as a drawing to prevent it from being copied], the work of an unnamed sailor or employee of the U.S. Navy, date unknown, PD-US; Mirror of St. Dominic in Prayer, El Greco, between 1586-1590, PD-US; A crown of thorns in the stores of Bedford Museum, Simon Speed, 18 February 2010, PD-Worldwide; all Wikimedia Commons. Over the past thirteen years, Dr. Joseph Hollcraft has taught at the Middle School, High School, and University level. Founder of Seeds of Truth Ministries, Joseph is an Adjunct Professor to the Avila Institute and host to the Seeds of Truth Radio program. Seeds of Truth airs daily to the north state of California and can be found as an iTunes Podcast where it reaches thousands of listeners in over 40 countries. In his first book with Emmaus Road, A Heart for Evangelizing, Dr. Hollcraft reflects into the principles of spiritual and pastoral theology, and its impact upon the new evangelization. Joseph has also been published with the likes of The Catechetical Review and the Homiletic and Pastoral Review. Joseph earned his B.A. and M.A. from Franciscan University of Steubenville, and received his Ph.D. from Graduate Theological Foundation with studies being completed at Oxford University. Most importantly, Joseph is a devoted husband and father. He lives in Chico, California with his beautiful wife Jackie, and their four children: Kolbe, Avila, Isaac, and Siena.